Our Power Wash Trailers are diamond plate, steel deck and powder coated for extra long life and extreme weather exposure. The pressure washer trailers feature leaf springs, integrated tank support, HD fenders and a fully adjustable hitch that accept pintle or 2 5/16″ ball. Power Wash Trailer Direct units are designed for EZ-Service and with horizontal coil heater engines to handle the shock of “over the road” conditions. 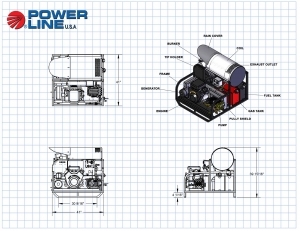 We engineer all power wash trailers and our “Load N Go” power wash systems with our “pump saver system” – that when the hose flow is released – the bypass water re-circulates back to water tank. This keeps the head of the pump cool extending its life substantially. The main pump we use are General Pumps. General Pumps is a division of Interpump Group – the largest in the world. The General Pump is a superior pump – we have literally 1000’s in service worldwide. Our volume with them is enormous which also keeps the price reasonable. We also back the pump with a 10 year warranty. Our trailer power washer units come with our dual antifreeze system where you close one ball valve and open the antifreeze ball valve – then run the machine for 30 seconds and the entire system is antifreezed. Start the machine – then recapture the antifreeze in the antifreeze tank and re-attach the nozzle and you are ready to clean! Power Wash Trailer Direct engineers pressure washers and trailer mounted power washers with precision and quality in mind. For over 25 years, we’ve specialized in the manufacturing of high quality industrial strength pressure washers. We specialize in hot water pressure washer systems. Call today for expert power wash trailer equipment advice!